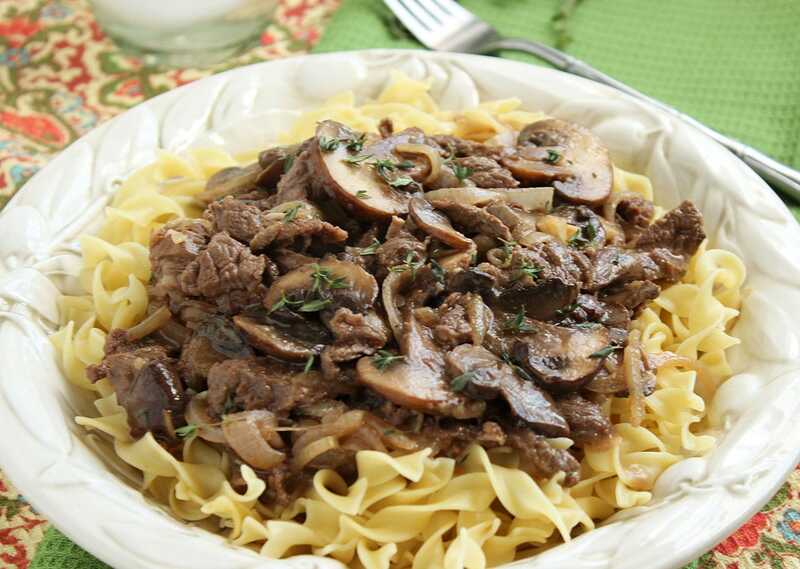 Hearty and satisfying, Skinny Beef Stroganoff takes just 20 minutes to make and won’t add inches to your waistline. 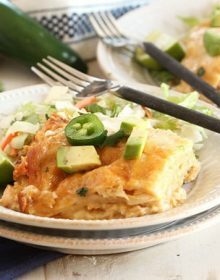 This lightened up version uses no butter or sour cream and is just as tasty as it’s full fat version. I hit a wall….and have a little confession. Last week, I couldn’t button my pants. I had to use an elastic band, a trick I learned during pregnancy, to close my pants. I’m a little ashamed but let’s face it I deserved it. My pants slapped me in the face with the harsh reality that I’ve been lazy….and stuffing my face with anything edible. Donuts? Check. Cake? Check. Shake Shack burger? Double check! It was like I had entered the crap food Olympics and was competing for gold. I knew it was coming….I’ve been sporting a jumbo muffin-top since Thanksgiving. Did I ever mention….I LOVE food? I could easily just go buy new pants, jeans or start wearing yoga pants but that would just exacerbate the problem. I mean really, if I give my waistline more room to grow….it will never end. So….I’ve been running. I start the whole weight loss thing slowly. I refuse to diet because….I love food. After I start moving (aka, running…walking, crawling…whatever that may be), then I work in a little healthy eating. I start eating less cake, donuts and Shake Shack burgers. (I really think the Shake Shack workers will worry when they don’t see me this week.) I begin eating more “real” food. Things that don’t have a lot of processed ingredients and definitely cut back on the sugar. Am I going to turn into a Paleo blog? Heck no. I still like to treat myself once in a while….and so should you. There will be no deprivation, I’m not going to for a 10 pound weight loss in 3 weeks….I’m not trying to really lose much weight at all. I just want to be able to button my pants. Baby steps, my friends. 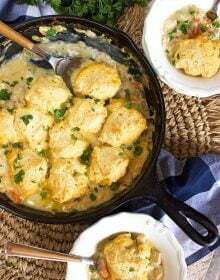 I took one of my favorite dishes ever….one that I usually load up with butter and cream and sour cream and butter and more butter….and then let it sit in the slow cooker all day (It’s glorious)…..and made it lighter. 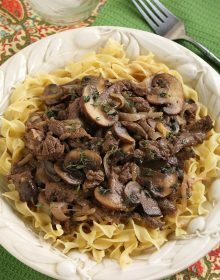 Skinny Beef Stroganoff is also ready in 20-minutes (minus the time it takes to prepare the ingredients.) How did I go from slow cooker to 20-minutes you ask? The Skinny version uses skirt steak instead of a chuck roast, the skirt steak cooks in minutes. It’s so fast you need to make sure all your ingredients are ready to go, like a stir-fry, so you don’t overcook anything. Mise en place, people. It’s a thing. I replaced the butter with a little olive oil and the sour cream/cream with plain greek yogurt. You don’t even know it’s light. Kinda like my Cream-less Cream of Mushroom Soup from back in the day. My husband insisted that I used butter but then how would I fit into my pants. Sabotage? I don’t think so. 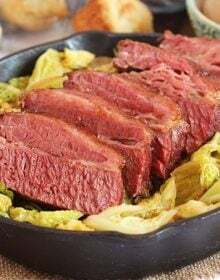 All you get here is a rich, beefy flavor that you’ll never know is lighter and healthier than what you would get in a restaurant. Serve this over a small portion of egg noodles or go super healthy and serve over zucchini noodles. It will be fabulous, I swear! 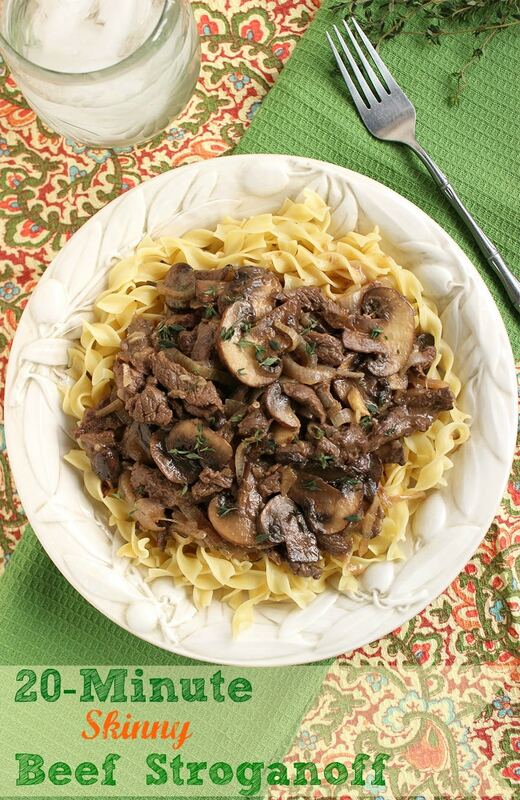 Super easy, Beef Stroganoff with less calories than a restaurant version. In a bowl, season the steak with salt and pepper. Toss the steak with cornstarch until coated. In a large skillet, heat the olive oil over med-high heat and add the steak. Cook the steak until browned on all sides. Transfer the steak to a bowl and set aside. Return the skillet to the heat and add the shallots. Cook the shallots until softened and add the mushrooms. Continue cooking until the onions are browned and the shallots are translucent. Add the garlic and cook for one minute. Stir in the garlic powder and thyme. Add the beef stock and bring to a boil scraping the bottom of the pan to loosen the brown bits. Return the steak to the pan. Stir in the yogurt and half and half. Bring the sauce to a boil and turn the heat to low. Allow to simmer for 3-5 minutes or until the sauce has thickened. Serve immediately over noodles. 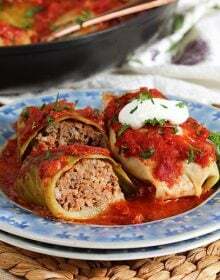 Looks like a really yummy version of such a heavy comfort food. 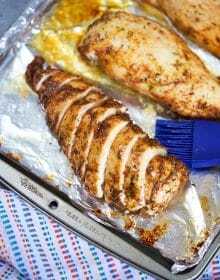 Love how you were able to lighten it up and keep so much flavor! My pants are feeling a little bit tight lately, too. Haha. I guess it’s that time of year! 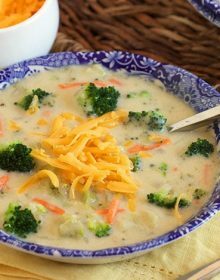 Great creative way to lighten up beef stroganoff – that’s actually a fave meal of mine so I will be needing to try this. 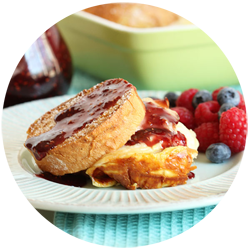 Not that I’m making excuses, but it’s so hard to be a food blogger making so many yummy recipes – I’ve struggled with the muffin top too! And sadly, my healthier recipes tend to flop while the decadent, fattening recipes do really well with our readers! 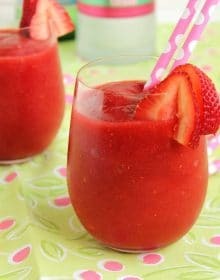 This recipe is great – looks deliciously indulgent but lower in calories! Sounds like winner! 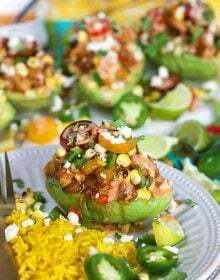 My best recipes are the not so healthy ones too….unfortunately, those are my favorites too. This is a fantastic idea (and one that I could really use, too). I love the addition of Greek yogurt for the creaminess! Ugh, isn’t the pant thing the worst?! I’m the same way…I refuse to buy something in a bigger size because I know it will just give me an excuse to eat poorly and drop back on exercise. You can get back there, girl…one day at a time! 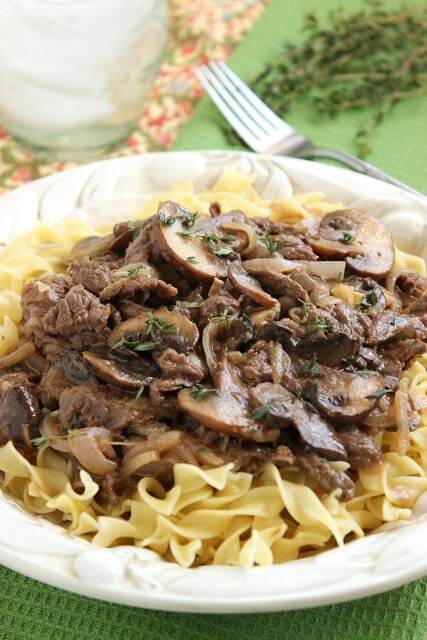 This skinny beef stroganoff sounds like a fantastic way to start. Your stroganoff looks absolutely delicious and it’s skinny! WINNER! I like that law….I mean, nobody can see the elastic band anyway. Right? 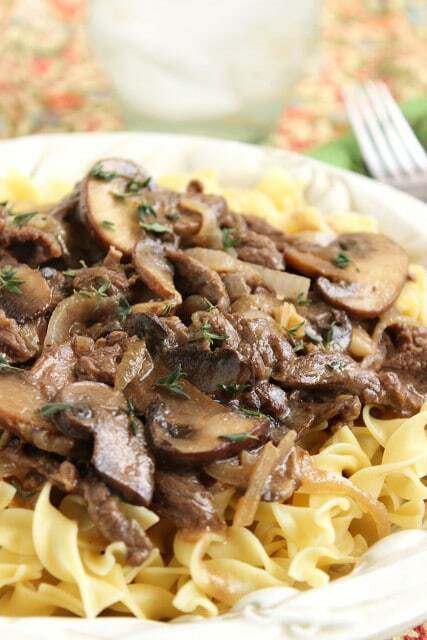 Beef stroganoff is one of my favorite meals but I agree about the calorie count. It’s so full of creaminess that I only make it a few time a years. 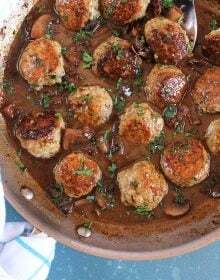 I love this skinny version and will totally try it next time my stroganoff craving hits. mm mmm, if this is just as yummy as it’s full fat version twin, I’m all over it! Personally, I think this is better! 20 minute meals are the bomb! Looks delish!